Thousands of people joined the special night-long prayers on the occasion of Shab-i-Meraj across the Kashmir valley and Ladakh region.Jammu and Kashmir Governor N N Vohra and Chief Minister Mehbooba Mufti, Director General of Police (DGP) S P Vaid and GoC 15 Corps Lt General A K Bhatt besides National Conference president Dr Farooq Abdullah and working president Omar Abdullah greeted people on the occasion.The Meraj-un-Nabi was celebrated with religious fervor and gaiety across the Kashmir valley and Ladakh region, where people joined night-long special prayers in shrines, mosques, Jamia masjids and other religious places despite cold.The main congregation was held at Hazratbal shrine on the bank of famed Dal Lake, housing the Holy Relic of Prophet Muhammad. Thousands of people, including women and children, joined the night-long prayers. The devotees had “Deedar” (glimpse) of Holy Relic after “ Fajr”( morning) prayers. 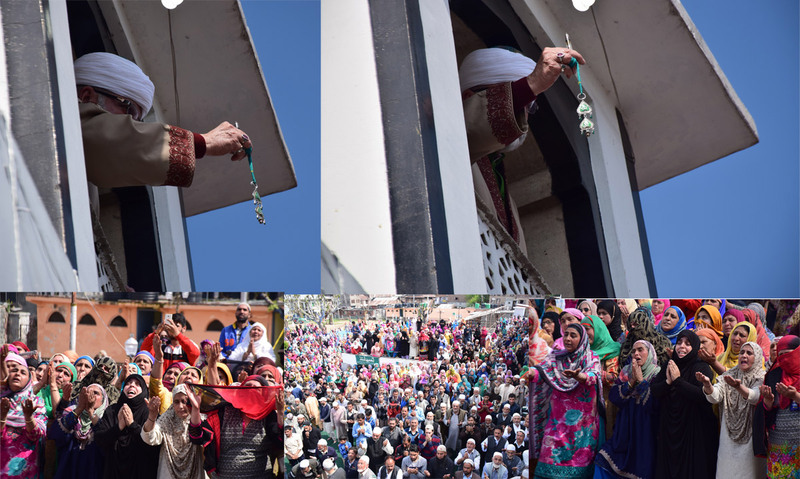 The devotees will have the glimpse of the Holy Relic after every prayers during the day.The authorities had made all arrangements, including electricity, water, medical and security for the devotees at the shrine. Inspector General of Police (IGP), Kashmir, visited the shrine yesterday and reviewed the security arrangements in and around there. A number of organizations have also set up stalls for the devotees.